Overall, I was not impressed by the content or the manner of either politician. I do not feel that very much was achieved at all. On one hand, if this was Salmonds chance to shine then the style adopted by him; a smiling figure of calm did not do anything at all to convince a neutral that his notion of Yes was accurate and compelling. A complete failure to give a comprehensive answer on currency has done his campaign absolutely no favours. I sympathise that he could not be drawn into an answer on a Plan B on the basis that if he had, Darling would have seized the opportunity to say that Salmond was not certain that Plan A would work. That even the first minister was uncertain. Salmond however, did not converge enough detail on currency and stuck firmly by the previous words of other politicians, mainly Darling himself. At first, this appeared to be an excellent tactic and perhaps Salmond was under the illusion that Darling would have been defeated by this point and cower in fear. Darling however, put on a brass neck to the fact that he has, in fact, declared a logical and desirable need for a currency union. He shouted enough and forced a ‘closed loop’ question on Salmond with enough authority to make it sound to the watching audience that he was correct and that Salmond was indeed failing to answer. 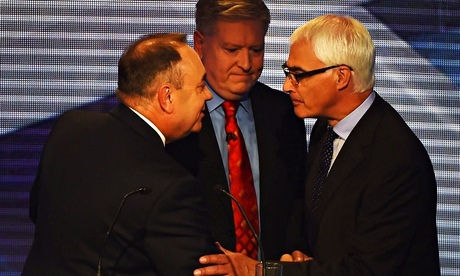 Not so much a point gained by Darling, but a point most certainly lost for Salmond. Similarly, Darlings negative, statesman and at times snarling stance did nothing to assure those whom are currently undecided that Voting NO! will be anything other than the same old, same old from Westminster. On a day when Darling should have been gleefully selling the newly promised ‘extra powers’ by the party leaders at Westminster upon a NO! vote, he shied entirely from them and in all honesty displayed to me the most certain sign yet that those promised powers will either never come to fruition or if they do be nothing more than futile powers reined in by Westminster control. At a time when he was faced with selling sand to the Arabs, to coin an old and possibly questionable phrase, he failed. I, for one, was not convinced that voting NO!, would come with any improvements in the status quo. The debate opened with various points that the studio audiences wanted answered in tonight’s debate. The first undecided voter asking, fairly, what would happen to the people if Scotland if independence fails and what the cost would be. The question seems fairly straight forward, unfortunately I think what people do not understand in politics is that there is no way it can ever be fairly or accurately answered. First of all, what does ‘failed’ mean? How do we judge failure? Are food banks failure? Was the banking crisis failure? Was the large amount of money spent at Grangemouth a failure? Is trident a failure? The question was so entirely open that thesis upon thesis could be written in theorem to discuss the answer. Needless to say, I wouldn’t imagine that undecided voter left the debating chamber on Tuesday night with any incline on their answer. The first NO! voter particularly irked me. The voter was older women, well spoken, who stated that over 300 years of successful, tried and tested Union should remain. I was not so much upset by her voting preference but by her own persona. I do not know the woman, nor do I wish to make this sound like a personal attack because it is not. It is a general opinion that I hold towards a large generation gap in our society. Do not stand here and tell me that a tried and tested Union should remain on that basis alone. If someone wishes to sell the Union to me then by all means do so, but this is a Union that we have witnessed destroy towns, defeat the ends of democracy in Scotland through unjust votes on devolution in the 70’s, introduce discriminatory Poll and bedroom taxes north of the border, oversee one of the worst financial crashes in history and march into countless unjust wars; even against its own people in Ireland. Tried and tested it may be, but a failure it would appear. For all of the great things that this Union may represent it leaves behind some significant black periods that both frighten and embarrass me. Unfortunately for this woman and more importantly her generation: they were the ones that allowed it to happen! So I apologise if I don’t always trust the views of ‘experience’ from an older generation that allowed us to be sold lies on countless occasions without so much as a ruffle of rebellion, watching those that did rebel crushed under the weight of those not prepared to stand up and be counted. Almost immediately, this point was trodden on by Salmond in his opening statement claiming that within a 10 mile radius of the live debate there were no fewer than 35 food banks. A successful, tried and tested Union? Food banks are something that is expected of a third world country and certainly within the poorer echelons of the world. Not in the heart of the largest city in a G8 country. Remind me again about this tried and tested success? Similarly, Darlings opening statement was to remind people that this vote is about the future of our country. This at first gave me hope. I genuinely thought that this was a great way to start the debate because what I seen on that state were two politicians that would use one another’s previous failings to make the other look untrustworthy and two politicians that would pick on the previous failings of Westminster, or on Holyrood, to strengthen their case for their vote. However, here was one of the main parties to the debate talking about the future of Scotland and not the past. At this stage he touched on more powers, without any detail or promise and stated that there is no going back after a Yes! Vote, completely failing to mention that history would blow that theory out of the water entirely. Politics change, Governments change and the needs of people change. Unions came come and go in world politics as quickly as they can in business; that is a fact of life. I wonder if Mr Darling would say the same based on the E.U. referendum. Would there be no going back should the U.K. leave the European Union under a Tory Government? Without adding too much detail, what happened after Darlings opening statement was exactly the opposite of discussing Scotland’s future but rather him and Salmond discussing the previous failings of each other as politicians, as people and of both Scotland and the United Kingdom. There was little to no discussion on the future, only what great or terrible things may or may not happen as applicable to their cause. Not that I was naive enough to expect contusive and constructive discussion, but Mr Darling promised it to me in his opening statement to the debate; so that’s a promise broken already. Needless to say, and as I touched on previously, there were two main points within this debate that resulted in most people declaring the end result a stale mate. First of all was Salmonds inability to answer the question posed to him by Darling regarding currency in an independence Scotland. His initial response being fairly reasonable and quoting Darling directly, albeit in an edited format, made Darling look slightly stupid and certainly created potential to put him on the back foot. Had Salmond the information and research and more to the point answers at this stage in the game or at least a plausible argument then he could have crucified Darling beyond repair. Instead, he stumbled, ruffled his clearly blank debating notes on the subject and allowed darling to scathingly attack his answer or lack thereof; correctly, justly and in an unforgiving manner. That was his job and he executed it powerfully. It was posturing from Darling but Salmond has to know within himself that a failure to provide an adequate answer would not justify enough merit to get him through. He should have stated, as he did, that he did not believe there would not be a currency union and highlight accurate quotes and reasons as to why not. However, he should then have portrayed what he thinks Scotland would or should do in the event that there is no currency union. If you have to give a little at this stage then fine, but giving a little with humility is better than losing the point with humiliation. Salmond needed to use this time to build a hope towards Scotland. Mr Darling and the No campaign have managed to successfully make Oil a bad thing in Scotland. We are constantly told that having Oil that will run out is pretty much a horrible thing to have. Yet we live in the United Kingdom where the main part of our economy is finance driven in an industry that is not yet regulated and liable to crash. These are major selling points for Scotland. We discuss oil like it is a dirty commodity, yet research shows that there is massive potential for further oil to be found in Scottish waters on the West coast; Oil that is currently unexplored. It is fair to say that Scotland should not be balancing its books on the back of Oil and Salmond had to be careful not to over-sell the point of Oil which has become, as I say, a faux pas of the independence debate. However, in the same breath, it is a major financial player in the United Kingdom and it would further be a major financial player in an independent Scotland; I feel that to hide from Oil and to leave it from the discussion is somewhat insane. It has become an elephant in the room, yet with no justification why. When discussing the Pulling and sharing of resources that Darling so prominently emphasised why did Salmond not just tell the cold hard truth on the matter, that in Scotland the pulling may very well be happening but the sharing is rather thin on the ground. Darling also stated that as much as he may have presided over the financial crash (a point that he managed to escape the debate from without suitable embarrassment) he managed to save the banks in a move that an independent Scotland could not have afforded. Another fair point, but why did Salmond not use this point to demonstrate that the United Kingdom is broke, it is as bankrupt as Ireland or any other nation and we are sitting on a ticking time bomb of debt that is liable to explode at any given time and will once again cripple our economy? Another elephant in the room that was not exposed yet would have been a handy duelling pistol at Salmonds disposal. In summary, Darling made his points and Salmond at times failed to capitalise of clear and significant weaknesses in Darlings armour. He failed to sell Scotland and to sell the potentials and possibilities post-independence. At this point I am aware of the fact that I am doing a bit of Salmond bashing. The half time summary would be swayed 60/40 towards NO! In light of some Salmond bashing I feel that it is only right to reverse the rolls here and to look at some of Darlings failings throughout the debate. The only real and significant failing of Darling was his inability to answer one simple, closed loop question: Could Scotland be a successful independent country? At this stage, Darling must have been feeling fairly comfortable. Salmond hadn’t really gone for the jugular in his questioning of Darling and you could see the relaxation coming across Darlings face, that is, until this little gem. Now, remember that Darling has told us at this stage in the debate about how proud he is to be Scottish and how wonderful a place Scotland is. It is not therefore beyond the realms of reason that you should expect a fair a reasoned response to this question. Again, as I said earlier, give a little with humility rather than lose it all in humiliation. At this point in proceedings Darling lost absolutely all momentum he had built up in relation to currency. Darling could not, or would not admit that Scotland would be a successful independent country. The simple answer for Darling at this stage was yes, of course we could make it work and be a success HOWEVER I believe that we are better and stronger as a Union and that no matter how successful Scotland is as an independent nation we will never be quite as successful as we can be as part of the United Kingdom. Giving a little yet taking a lot, he would have marched through that debate without any problems whatsoever and left Salmond with very little but egg on his face. Instead, his own unwillingness to give an inch resulted in him losing the full yard. He hesitated and tried to give everything but a ‘yes’ or ‘no’ answer, refusing in part to show any kind of positives about Scotland, humility but rather a pented up frustration and desire to show Scotland as negatively as possible in order to support his case for the Union. Furthermore, with the tie balanced at 1-1 there was a massive opportunity for the debate to be spun on its head. Unfortunately, where Darling failed miserably so did Salmond as he failed to exploit an area of questioning that had to be pursued by Bernard Ponsenby. When asked what extra powers Scotland would be afforded upon a NO! Vote Darling collapsed like a proverbial house of cards. He look almost terrified by the line of questioning, particularly with his inability to give an answer and a sure fire sign to many in the audience that this promise was as empty as Nick Cleggs when he opposed tuition fees. There was absolutely nothing from Darling that persuaded me of anything other than the same old lies over and over again. No fresh dawn, no radical change in equality; just an acceptance of the same old that those who have will always have and those that don’t will be destined to help maintain the needs to the have. No one stated how Scotland would prosper either independently or as part of the Union. If anything, it was a glum affair that focused mainly on the negatives of Scotland rather than the positives. That will do little to persuade the undecided to vote Yes or No and will do little to keep some of the skilled people in this country long term. There is a reason many skilled people are leaving this country, and it is not always the weather or the promise of better pay; it is an adverse reaction to the negativity that surrounds Scotland and its potential. In summary, if Scotland is as much as a drain on finances and resources as Darling would have you believe; why does anyone in England or in Westminster have the desire to keep us in the first place? That is a question that I fear these debates will never clearly answer! This entry was posted on August 7, 2014 at 13:47 and is filed under Current Issues, Politics. You can subscribe via RSS 2.0 feed to this post's comments. You can comment below, or link to this permanent URL from your own site.